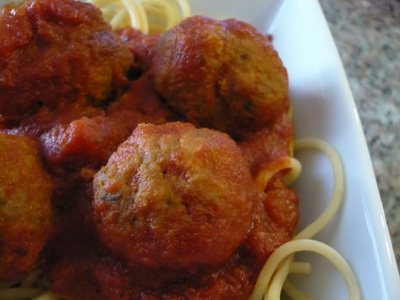 My family loves meatballs, and since this recipe uses ground turkey instead of ground beef, it’s definitely a healthier alternative. My kiddos devour turkey meatballs just as they do beef meatballs. Over many times making and honing this recipe, I’ve found that the longer the sauce simmers, the thicker, the richer, and the yummier the sauce gets, so if you have the time, simmer away. Sauce: in a large nonstick skillet, heat olive oil over medium high heat, add garlic and cook for 1 minute; stir in 1 tsp. Italian seasoning, thyme and tomatoes. Season with salt, pepper and sugar. Bring to a boil; reduce heat cover and simmer for at least 25 minutes….longer if you can. Meatballs: in a large bowl, combine ground turkey, egg, bread crumbs, cheese and remaining 1 tsp. of Italian seasoning. Form 1 1/2 inch meatballs. Add meatballs to sauce, spooning sauce over to coat. Cover and cook over medium heat until meatballs are just cooked through, about 8 minutes. Meanwhile while meatballs are cooking, cook pasta. I keep experimenting with sauce for fish tacos (attempt 1, attempt 2, and attempt 3). I found this one at epicurean.com, and it’s is a winner! I found this recipe on the Closet Cooking food blog, and we tried it tonight. It was really tasty. 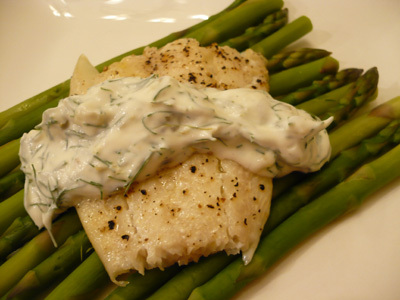 When we cook fish, we usually cook salmon or steelhead trout, but tonight we used haddock. I think this sauce will be even better on the trout or salmon. When we lived in Oregon, one of my favorite restaurants was Mo’s, and this sauce tastes so much like their tartar sauce, which I loved. In fact, I bet if you substituted mayo for the sour cream you’d have a very close version of Mo’s tartar sauce. This pineapple salsa is delicious. It’s best to use fresh pineapple, but if you can’t get ripe pineapple you can substitute canned chunked pineapple. The salsa also is great with fresh mango. I usually make this salsa in the summer time, and I top some grilled chicken with the salsa. It makes for a fresh light dinner. Tonight I topped baked salmon, and it was excellent. I’ve made this salsa for lots of people and it always goes over very well. My brother-in-law and sister-in-law prepared the most scrumptious dinner for the family’s Christmas Eve festivities. Tonight we made the dish, and it was delicious! So delicious that our oldest, TT, had 3 helpings of the fish and he said to our youngest, LE, “LE you should eat the fish. It’s delicious!” Quite high praise coming from a three and half year old! Try it…it’s delicious. 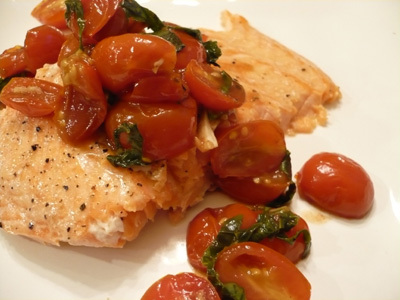 This is a great entertaining dish, because the roasted tomato “salsa” can be made ahead of time, and then you just pop the fish in the oven when you are ready. As Andy and Jen did, we served the fish with Green Bean and Potato Salad. Position a rack in the middle of the oven and preheat to 350 degrees F.
Toss the tomatoes with 1 tablespoon of the olive oil, garlic, vinegar, salt, and pepper to taste. Spread out on a baking sheet and roast until the tomatoes get juicy, about 15 minutes. Transfer tomatoes to a bowl and toss with the basil. After the tomatoes come out of the oven, place the fish on the baking sheet; drizzle olive oil over fish, and sprinkle with salt and pepper. Bake until fish flakes. Fish tacos have become a staple at our house. The adults actually have fish tacos and the kids have fish with ketchup and a tortilla on the side. Even though we aren’t all eating the same exact thing, it works, and we don’t have to make the kids a special meal. Since we’ve been having the tacos quite a bit, I’m trying to come up with delicious sauces to accompany them. 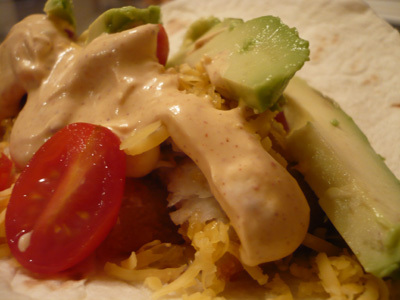 Tonight’s fish tacos had fish, cheese, tomatoes, avocado, and the Baja sauce. This was my first attempt at a Baja sauce, and I think it turned out very tasty. 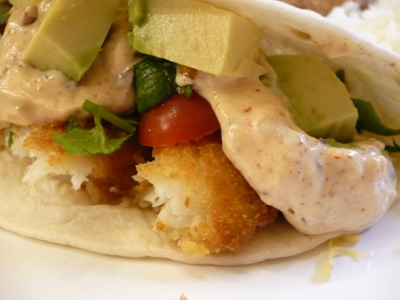 Top fish taco and enjoy! We’ve made this recipe since it first was published is Cooking Light, September 2002. It’s one of our favorite recipes, and everyone we’ve ever made it for loves it too. It’s delicious and spicy, so if you’re not a spice fan, go easy on the curry paste. We love spicy food, and we put in a heaping teaspoon of the curry paste, although I do add in more fresh ginger than the original recipe calls for. 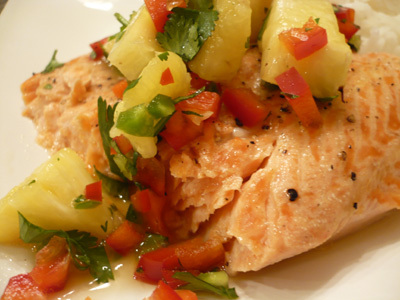 The original recipe calls for using Tilapia, which is good, but we often use Salmon, and that’s really good. Some might argue that the sauce is too strong for such a flavorful fish as Salmon, but I love the texture and butteriness of the Salmon. The curry sauce is also an excellent curry sauce for chicken. Simply season chicken and veggies of choice (I use onion, eggplant, zucchini, and red pepper) with salt and pepper and stir fry (I stir fry each item separately and then remove from pan and keep warm while cooking the rest) in sesame oil, garlic, and ginger until done, then remove from pan. 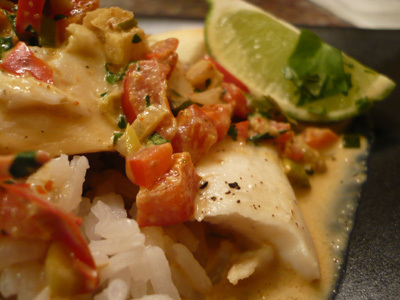 Make sauce using ingredients from curry powder through Thai basil; then squeeze some lime in and serve over rice. Delicious! I didn’t have any coconut milk on hand tonight, so instead I used 1/2 cream and 1/2 2% milk and it was delicious. Heat sesame oil in a large nonstick skillet over medium heat. Add ginger and garlic; cook 1 minute. Add pepper and onions; cook 1 minute. Stir in curry powder, curry paste, and cumin; cook 1 minute. Add soy sauce, sugar, and coconut milk; bring to a simmer (do not boil). Remove from heat; stir in cilantro. Put enough foil on a baking sheet to wrap your fish. Place fish on foil, and drizzle with sesame oil, and squeeze 1/2 of a lime onto fish. Sprinkle fish with salt and pepper. Wrap fish in foil, sealing the edges. Bake until fish flakes. Depending on the thickness of your fish it can take anywhere from 12 minutes to 18 minutes for the thicker pieces. The nice thing about steaming fish is that you can’t really over cook it. Alternatively you can broil the fish.